LG begins 'Life's Good' lounge tour to demo 3D TV | What Hi-Fi? The tour uses an interactive living room installation featuring an oversize sofa and 3D TV demo, giving shoppers the chance to experience the difference between active and passive 3D technology for themselves. 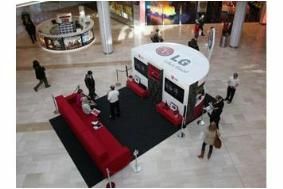 With a sofa "big enough to fit the whole family" and treats to enjoy, visitors to the LG demo will be able to ask about the latest 3D tech, participate in 3D gaming and see what nature, sport and drama programmes look like in 3D.